Who can resist a devilishly decked out, fluffy white puppy? 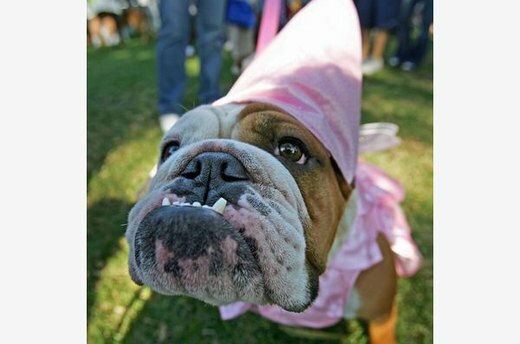 Or a bulldog dolled up as a princess? Not many, apparently. According to the National Retail Federation, Americans will spend over $300 million on Halloween costumes for their pets this year. If you're thinking of dressing up your pet, take some inspiration from these adorable costumed critters. 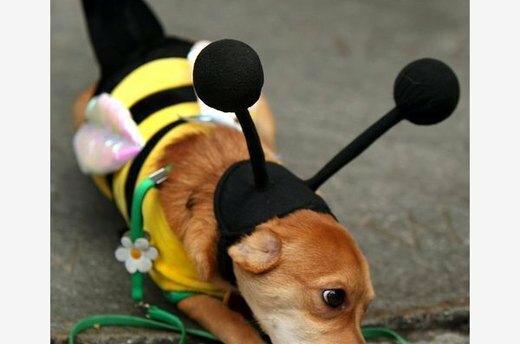 Bumblebees and ladybugs are perennially popular choices for pooches. 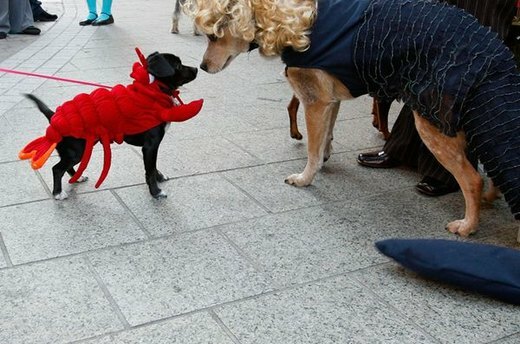 When selecting a costume, Dotty Zolper, merchandise manager at BuyCostumes.com, recommends something loose-fitting, so that your furry bug can move freely and comfortably. If you have multiple pets, get a theme going. 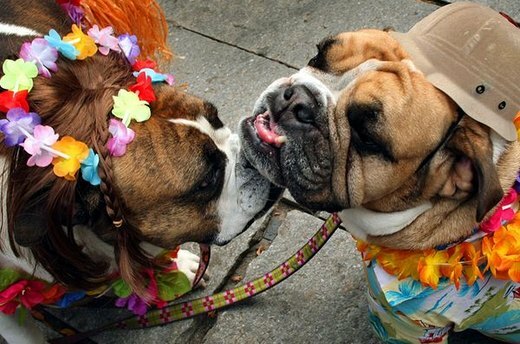 These bulldogs are ready for the Big Island with their hilarious Hawaiian get-up. Nothing's better than adorable animals posing as ... other adorable animals. 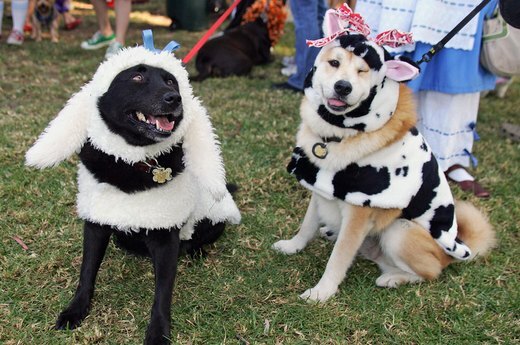 These dogs go barnyard-chic for a day as a sheep and a cow. 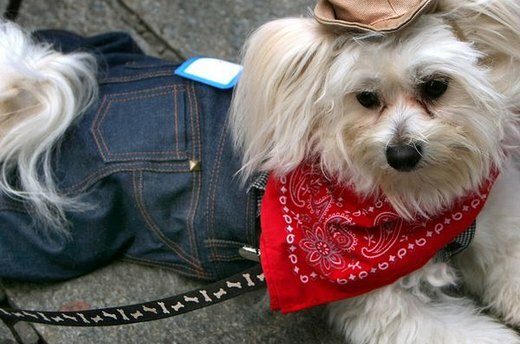 You can't have a farm without a farmer: This dog dons jeans, a cowboy hat and a kicky red bandana for herding those cows and sheep. Lobster sniffs mermaid in this magical underwater scene. In the midst of all this fun, keep in mind that the Humane Society urges you to avoid giving your dog Halloween candy of any sort. Stick to dog treats. 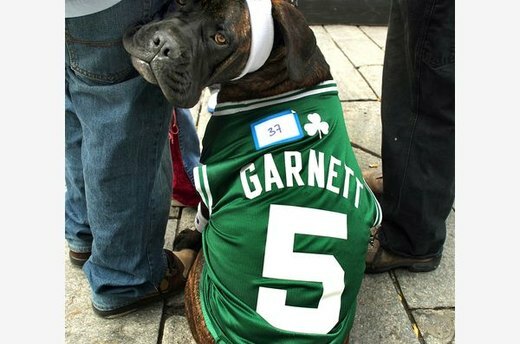 Show your dog's team spirit by breaking out the trusty headband and jersey for a costume any sports nut would appreciate. This dog is ready to bark on his favorite basketball team. According to Zolper, superheroes are popular this year thanks to the regular crop of summer action-movie blockbusters. Zombies, pirates and vampire costumes are also in demand. "Pop culture plays a big role in what's hot for the year," says Zolper of BuyCostumes.com. 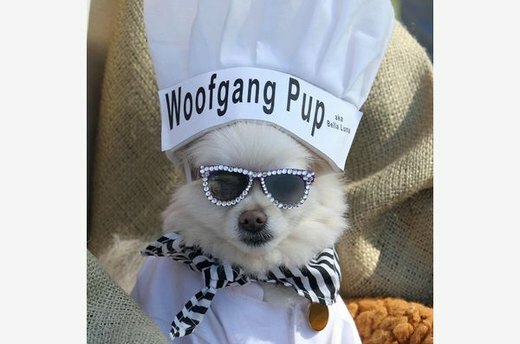 This homage to celebrity chef Wolfgang Puck shows how popular cooking shows have become. Make that irresistible mug even more precious in full pink princess regalia. You treat her like royalty all year, so let her play the part on Halloween. 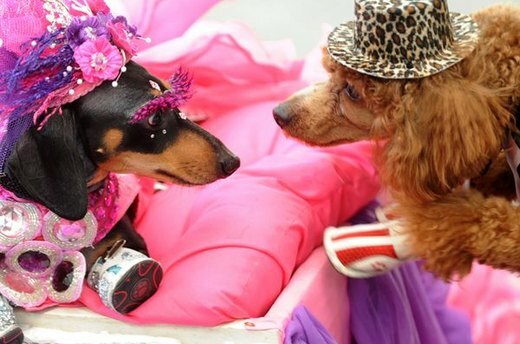 These fancy Fidos are decked from head to toe. Have fun, but be careful about overdoing it. Your dog should comfortable with all aspects of his costume; your pet's well-being is far more important than the perfect look. 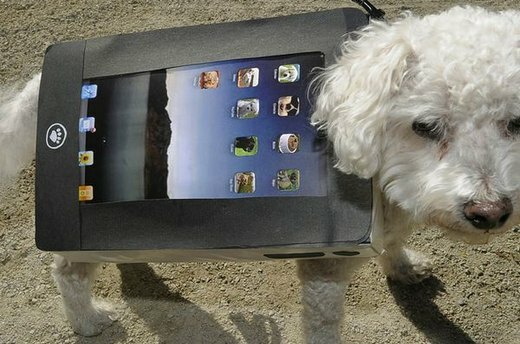 This pup went high tech at the popular Tompkins Square Park Annual Halloween Dog Parade in New York City. 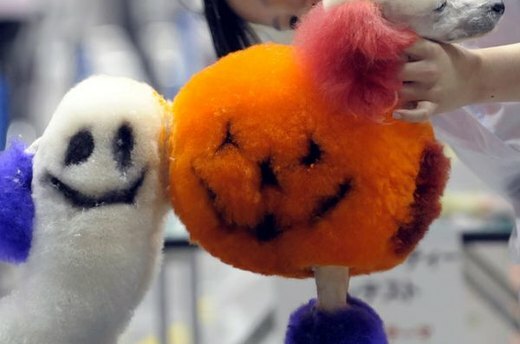 If you've got a creative idea, try making your own pet costume. Some folks use their dog's natural assets for a costume -- like this poodle's at the FCI Japan International Dog Show in Tokyo. 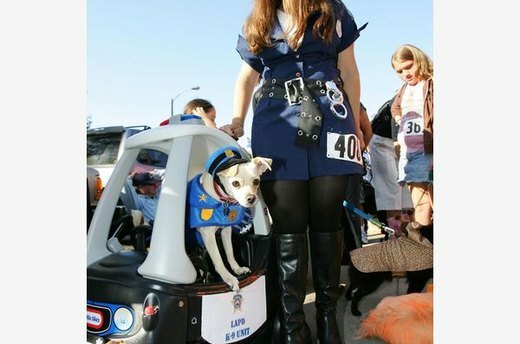 Getting in on the fun with your dog is highly encouraged. Try a theme suited for the two of you. Zolper agrees. "If you dress like a monkey, you can have your dog be the banana," she suggested. Ketchup and mustard is another popular pairing. 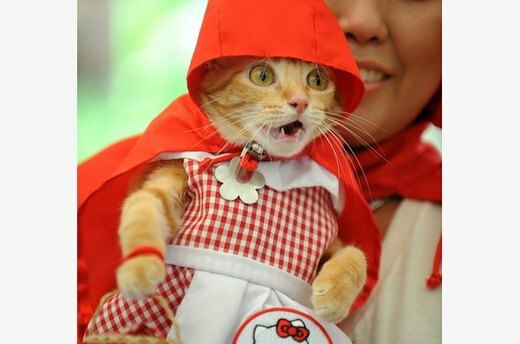 While it's unlikely your cat will allow such an indignity, this tabby gets into the Halloween spirit as Little Red Riding Hood. But if your cat isn't receptive, don't force it.